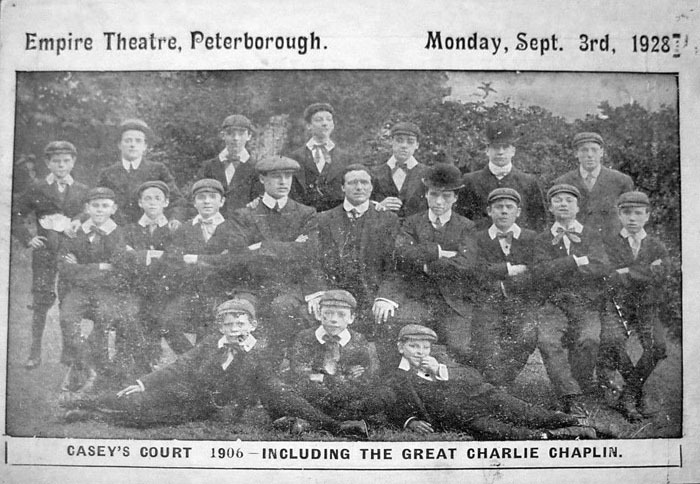 A promotional card for a “Casey’s Court” performance at the Embassy Theatre on Broadway in 1928, The card features a promotional image from a show back in January 1906 at Peterborough’s Empire Theatre that featured a young Charlie Chaplin (bowler hat just right of centre). Music Hall star Will Murray created his twice nightly crazy show ‘Casey’s Court’ in the mould of the popular ‘gang show’ that we still see in our theatres today. The cast was made up predominantly of children, with Murray dressed in drag and failing to keep them in order as his character ‘Mrs Casey’. 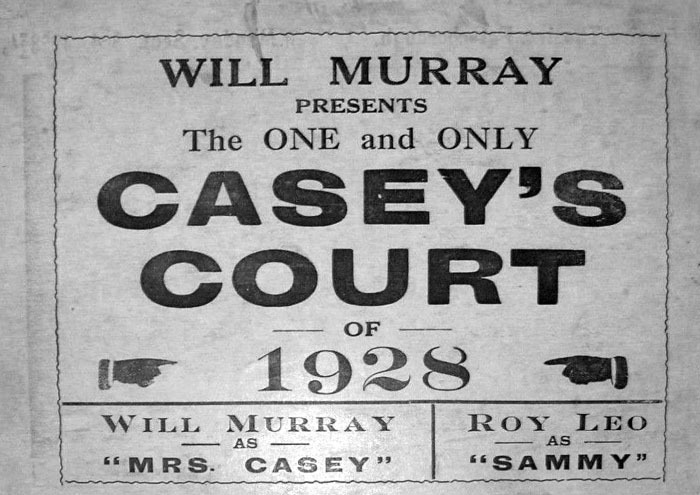 First launched as ‘Will Murray’s Casey’s Court’ the show went under several slight alterations to the name. At various times the promotion posters would be for ‘Casey’s Court Circus’, the ‘Will Murray Gang’ and finally ‘the Casey Circus (prop Harry Cardle)’. The show ran for a surprisingly long time, starting just after the turn of the 20th Century and finally closing some time in the early 1950s. The travelling show had many rising stars who would become well known on the music hall circuit. Harry Beasley was in the show from the start. At one point John Lennon’s father, called Alf but nicknamed Freddie, is said to have run away from an orphanage to join the troop, before later being forced to return by the authorities. Other stars who ‘cut their teeth’ in the show, quite literally in some cases given the age of the cast, were Billy Baggs, Tom Gamble and Harry ‘Alka’ Seltzer. Harry went on to become prominent in the Grand Order of Water Rats, the organisation that brings together all branches of entertainers in order to perform great works of charity. In the Rats, Harry was at various times Treasurer, King Rat, and a Trustee for the last twelve years of his life (he passed away in 2004). However, the most famous cast members of ‘Casey’s Court’ were undoubtedly the two young lads who went by the names of Arthur Stanley Jefferson and Charles Chaplin. Chaplin was recruited by Will Murray in 1906, and his sketch in the show featured him playing a fake medicine seller. However, he chose to leave Casey’s Court after just a year, when he was offered a job as a clown in the slapstick comedy company ‘Fred Karno’s Fun Factory’. It was with Karno that he was to cross the Atlantic and find later fame in the movies. In 1910, Arthur Stanley Jefferson would also follow Chaplin to the Karno Fun Factory, finding fame in the USA, but only after a later change of stage name to Stan Laurel !